Di Morelli Clear Skin Exfoliating Pads are composed of 10% Glycolic Acid (alpha hydroxy acid) and 2% Salicylic Acid (beta hydroxy acid). Regular use of these pads will help to prevent acne from forming and help heal existing acne. This is an ideal treatment for removing blackheads, controlling excess oil and evening out skin tone. 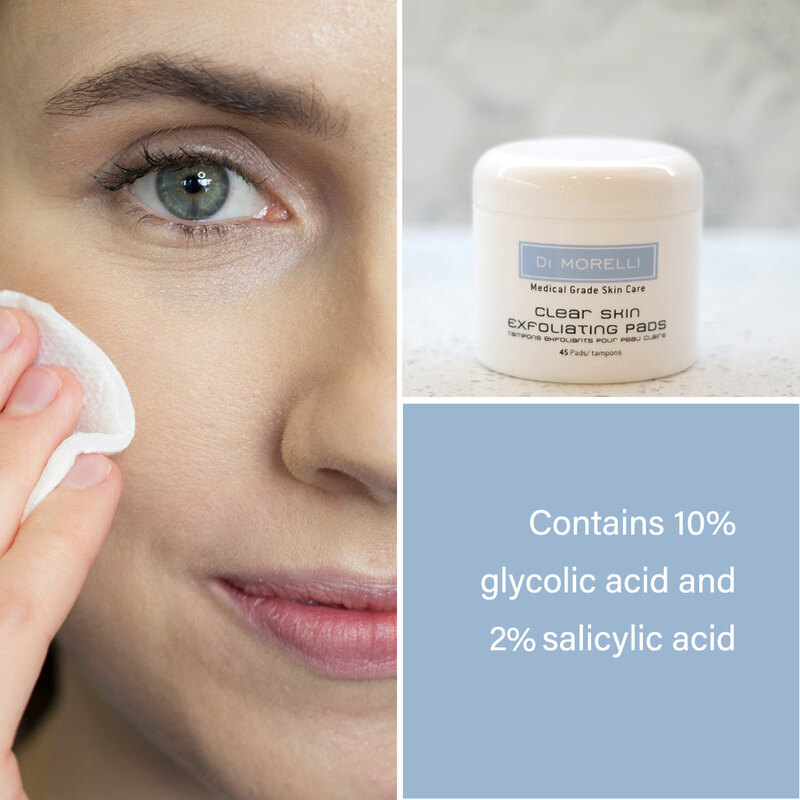 ** This product contains glycolic acid, an alpha hydroxy acid, that may increase your skin's sensitivity to the sun and particularly the possibility of sunburn. Please limit sun exposure and apply Di Morelli SPF 35 while using Clear Skin Exfoliating Pads and for a week afterwards. Apply product to affected areas once per day or as directed by a healthcare practitioner. Because excessive drying of the skin may occur, start with one application 2-3 times per week, then gradually increase use if needed. If dryness or peeling occurs, reduce application. Alpha hydroxy acid (AHA) derived from sugar cane. Water soluble and having the smallest molecular size, it effectively unglues the outer layer of dead skin cells and helps increase cell turnover. Beta hydroxy acid (BHA) derived from the bark of the willow tree. This ingredient works by softening keratin, a protein that forms part of the skins structure. This helps to loosen dry and scaly skin, making it easier to remove. Due to its lipophilic (fat soluble) nature, it is able to penetrate through oil filled pores making it an excellent anti-acne ingredient.